The plane circled slowly, searching. The US Navy pilot and crew had been trained to locate and report the position of the prey under the waves. Once sighted, a message would be sent to the US Navy Air Station ashore which then relayed the sighting to a subchaser or US Coast Guard cutter in the area. The warship would signal 10 to 15 pursuit vessels, inform them of the prey's reported location and the hunt would begin (Scofield, 1920). All the men in the air and on the sea were searching for the bright crescent of light that would be visible during the dark of the moon (Scofield, 1924). The inner edge of the crescent would be green and the outer edge red (Daniel Miller, private communication, 19 September 1989). Once a vessel sighted the crescent of light, the entire attack fleet would employ a number of capture techniques to ensnare the prey. This was no hunt for an enemy submarine, but the latest twentieth century technology being used in 1919 to assist fishermen off the San Diego area in locating schools of Pacific sardine, Sardinops sagax. Sardines were just beginning to be used by the canning industry. Sardine canning started on the US west coast in 1889 at the Golden Gate Packing Company of San Francisco (California). When the San Francisco plant closed in 1893 the equipment was sold to the Southern California Fish Company in San Diego (Thompson, 1926). This company canned sardine in oil, mustard, spices and tomato sauce in two, one, and quarter pound sizes until 1909 (Smith, 1895; Thompson, 1926). Another cannery started producing canned sardine in 1909 at San Diego but closed in 1913. By 1915 three sardine canneries were in operation, one in San Francisco and two in Monterey. The Monterey plants commenced canning in 1902 (the Booth plant) and 1906 (Monterey Fishing and Packing Company). A San Francisco plant opened sometime between 1900 and 1915 (Schaefer et al., 1951) (Fig. 3.1). The sardine packed at the Booth plant were labeled mackerel until this practice was stopped by the US government in 1910. However, canned sardines from California soon gained a reputation for having flavor and quality equal to the then-preferred French brands. Fig. 3.1 Location of study area. Sardine canning and reduction had become the largest fishery on the west coast by 1925. This major industry landed 173,000 tons of sardine in California and another thousand in British Columbia (Canada) during that 1925-26 season (Radovich, 1981). The sardine fishery had started out as a supplier of fresh whole fish in the 1860s and sardines had also been used as bait since the 1880s (Smith, 1902). The shift to canning from the 1890s to the 1920s actually created two new industries. The first produced a high quality and highly valued canned sardine for human consumption; the second produced protein-rich feed for chickens as well as fertilizer for green plants. The chicken feed and the plant fertilizer were produced from canning waste, using a process called reduction. The value of this by-product soon caused canners to set up their own reduction plants at the canneries. By 1920 the increased demand for sardine meal and fertilizer resulted in some plants using whole fish along with canning waste to produce fish meal, flour, oil and fertilizer. The California Department of Fish and Game became concerned about the direct use of sardine for nonhuman consumption in 1920. Starting in 1920, and excluding only 1923 and 1924, new laws were passed to curtail the use of whole fish for reduction in every year through 1941 (Schaefer et al., 1951). The position of the US Bureau of Fisheries was that "[canned] sardines must sell at a price that is based on their own cost of production. Production of fish meal and oil can not [sic] continue to dominate canning" (Beard, 1928). This statement was made because only plants which canned fish could legally reduce sardines: canned sardines were being produced and sold at cost or at a loss so that canneries could obtain enough waste and whole fish for reduction. Selling at or below cost kept the sales of canned sardines above what the market would have demanded. The high quality of the California canned sardine resulted in a product which could be sold in almost all existing canned sardine markets, thus increasing the sale of California sardine. The canners also received another benefit from maintaining the high quality of their canned sardines. The canning of high quality sardine produces more by-product per ton of fish landed; because there is an increase in the amount of offal and unsuitable whole fish, the assured quality is higher. This meant that more fertilizer and meal could be produced from each ton of sardine landed. Although the state and federal governments were in agreement on the need to reserve the sardine resource for human consumption, the economics of reduction and the legal apparatus mitigated against this being accomplished. The major loophole in the legal structure existed when fish were caught and processed outside the three-mile state jurisdiction. The inability of the state to reserve the sardine resource for human consumption became clear during the 1926-27 season, when a Monterey canner towed the concrete barge Peralta outside the state's three-mile jurisdiction and commenced reducing sardines, without even the pretext of canning. Because of financial, legal, and social problems, this vessel never successfully obtained sardines. A self-propelled vessel, the SS Lake Miraflores, also tried to obtain fish, but fishermen would not sell to her off Monterey or Santa Barbara (Fig. 3.2). The same vessel did obtain some fish off San Pedro, but the operation proved unprofitable. In November 1930 the vessel moved north to the waters just south of San Francisco; another vessel, the SS Lansing, joined her in 1932. These ventures became profitable and, as a result, floating reduction plants became common off all the major sardine ports from San Diego to San Francisco. Fig. 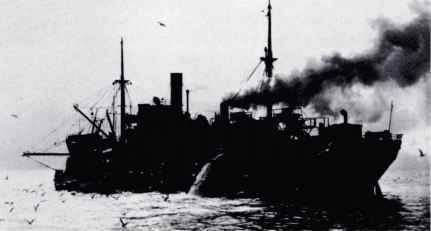 3.2 SS Lake Miraflores, the first reduction ship to operate outside the jurisdiction of the State of California, unloading sardines from a purse seiner in the early 1930s (Glantz and Thompson, 1981). Such vessels, along with a few others, operated until 1938, when oil and meal prices fell and an amendment changed the State of California's constitution. This new amendment gave the state the authority to stop offshore reduction plants. Legal proceedings were not brought to bear on these at-sea reduction plants, because the vessels had stopped processing by the time the amendment became law. The reduction ships had landed a total of 778,560 tons of sardine in nine seasons. These nine seasons occurred during some of the best years in the sardine fishery. At-sea purchases of sardines represent an annual average of 16 percent of the sardines landed during the period. The 12 seasons from 1934 to 1946 would have to be considered as pax-sardinia in the California fishing industry. Landings averaged 599,467 tons a season. World War II prompted good prices for oil, meal, fertilizers, and canned sardine. State fishery biologists had been warning for years that the sardine biomass could not sustain removals over 250,000 tons. However, the industry and federal agencies resisted, thwarting the state biologist's attempt to enact a quota of that size, or indeed any quota at all. "The canneries themselves fought the war by getting the limit taken off fish and catching them all. It was done for patriotic reasons..." (Steinbeck, 1954). During the next six seasons, from 1946 until 1952, landings averaged 234,068 tons. This amount was about 40 percent of the previous 12-season average. The next 10 seasons, through 1962, recorded average landings of 55,322 tons, or one-tenth the record mid-1930s to mid-1940s seasons. The last si:5&seasons of the fishery produced average landings of 23,985 tons (Table 3.1 and Fig. 3.3). As one fisherman who participated in the last season (1968) said, "In the last year we caught them all in one night" (Louis Mascola, private communication, 6 September 1989). A fishery biologist, when asked to comment on the fishery, said that "It was big while it lasted" (Ralph Silliman, private communication, 18 September 1989). * There are enough 10-inch sardines in these landings that together, if laid end to end, would reach from the earth to the moon and back (Reinstedt, 1978). t During the history of this fishery, all landings were reported in short tons (908 kg). Hence the weights in this chapter have not been converted to metric units. Table 3.1 Sardine catches from the Pacific Coast of North America (from Murphy, 1966). The history of the sardine fishery is not just a story of landings, government regulations and industry exploitation; nor is this story being told to affix the blame or determine the cause of the sardine fishery collapse. The causes could have been overfishing (Scofield, 1938; MacCall, 1979), management conflicts (Ahlstrom & Radovich, 1970), climate change (Smith, 1979) or, most likely, a combination of all of these. Upon following this fishery from the 1860s to its demise in 1968, one not only becomes aware of the vast quantity of sardines harvested and the loss of a very valuable industry, but also of the people who worked in the plants, caught the fish and invested their funds in this colorful dynamic venture. The loss of the sardine industry had ramifications for the west coast fishing community, the State of California, and foreign nations in Central and South America, and Africa. The lessons available on how people, institutions, and society coped with, and learned from, this loss are every bit as important as the lessons learned from the loss of the resource itself. The California sardine fishery was composed of the aforementioned groups of fishermen, plant workers, and entrepreneurs. These three groups of people are in no way mutually exclusive. Some fishermen and their families were involved in all three activities. Others invested and fished or invested and worked. In the very beginning in San Francisco most of the fishermen were Italian (San Francisco Chronicle, 20 July 1885). As the fishery moved to southern California, Portuguese and "Jugo-Slavs ('Austrian')" [sic] fishermen predominated (Skogsberg, 1925). Fishermen from Oregon and Washington in the 1930s were mostly Scandinavian. The period of expansion and large landings covered 21 years from 1925 to 1946. With one exception during that period, these nationality groupings stayed roughly the same throughout the fishing communities. In the late 1920s and 1930s Japanese-American fishermen dominated fishing for sardine out of southern California (Higgins & Holmes, 1921). At the outbreak of World War II, Japanese-American fishermen were removed to concentration camps, never to regain ownership of their vessels or their dominant position in the fishery. Beside the foregoing nationalities, two other nationalities were prominently involved as plant workers: the Mexicans and Chinese. Most of the higher skilled workforce at the plants were related to fishermen or came from the same ethnic background as the fishermen in that port. 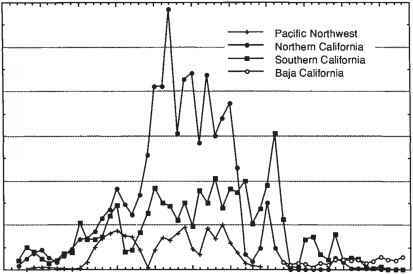 The Monterey area, southern California, and the San Francisco area produced the majority of canned sardines and fish meal. The most famous of the sardine canning communities was, and still is, Monterey. Monterey's fame can be linked to its current tourist popularity and also to the writings of John Steinbeck, even though southern California landed as many sardines and San Francisco started earlier. The national and international distribution of the "top of the line" Monterey-canned sardines also contributed to the area's fame and recognition. During the Great Depression (1929-41), Monterey did not suffer as much as most other areas of the US, because sardine production remained high and even increased in the late 1930s. Although the Monterey canning area became "a poem, a stink, a grating noise" to many Americans (Steinbeck, 1945), it meant bread on the table to those involved in it. The Legaz family was one of the families that earned its livelihood from fishing. They were of Austrian decent and started their own fishing business in 1912. In that year, with his cousins and brothers, Mr. Legaz bought a small trawler and named it the Legaz Brothers. The oldest of the Legaz brothers subsequently bought the Georgia in 1917, the Ansonia (70 feet - 21 m) in 1927, the Valencia (75 feet - 23 m) in 1928, the Marconia (80 feet - 25 m) in 1937, and the Leviathan (98 feet - 30 m) in 1946. In 1947 he invested in a sardine plant and sold out a few years later, not losing any money. His sons fished with him from age nine or ten, until they could buy their own vessels or skipper one of the other boats in the Legaz fleet. In the 1940s oil was the big moneymaker from sardines, not canning (Louis Legaz, private communication, 1 October 1989). Investing in a plant that reduced sardine was one way for fishing families to get rich. The Legaz family was one of hundreds of families and thousands of people who fished for sardine for part of a year. A typical multi-fishery pattern consisted of fishing for salmon on the west coast of Alaska from June through September, sardine off California from October through March, and squid fishing near San Pedro and Monterey in April and May and sometimes September. The number of vessels involved in the sardine fishery was substantial. As late as 1956, the October monthly report of the Monterey office of California's Department of Fish and Game states that 150 vessels and eight airplanes were active on one night. During the 1956-57 season, landings were 33,580 tons. Each seiner and lampara vessel had between six and 10 people on board. If you expand this fishermen ratio to the pax-sardinia fleet of 500 vessels, then 4,000 fishermen were employed for half a year, or 2,000 fisherman-years of work annually during the 1930s and early 1940s. 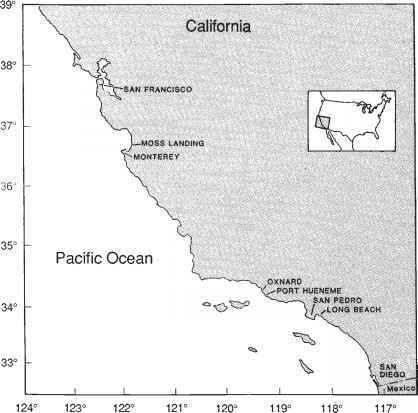 The California landings in 1943 were about 500,000 tons, and in 1946 about half that amount. The ex-vessel values were US$10.8 and US$6.9 million, respectively (Pinsky & Ball, 1948). The product value in 1943 exceeded US$29 million and in 1946 is estimated to have been about the same, although the 1946 catch was actually much smaller. If we expand this product value with a conservative consumer price index (CPI) to 1989, the product value would exceed US$210 million (1946 CPI = 52, 1989 CPI = 380, 1967 CPI = 100) (Anon., 1989). Yearly employment was over 9,000 in 1946, probably far greater in 1943, and likely to have been over 25,000 in 1936, based on the relative size of the reported catches. The wages paid to these 1943 workers was around US$28 million, equivalent to US$200 million in 1989 dollars. Monterey fishermen continued to can fish until 1957, but reduction ceased by 1950. Most of the fish canned in Monterey during the 1950s were trucked in from southern California. Fishermen received an agreed-upon price regardless of the quantity landed, but had to pay the cost of trucking. The trucking rates and prices were negotiated between the union and the remaining two Monterey buyers in the late 1950s. Fishermen negotiated an ex-vessel price of US$47.50 per ton in 1955, but after paying the cost of trucking, loading, unloading, and ice they received only US$40.00 per ton. In August 1957 the agreed price rose US$5.00 to $52.50 per ton, but fishermen received US$2.50 less, $37.50, because the costs associated with transporting the sardines were increased to US$15.00 per ton. In October 1957, transport costs were raised to US$18.00, lowering the net received ex-vessel price to US$34.50 (see the monthly California Department of Fish and Game reports for the period 1945-65). By 1960 only the bait fishery remained in Monterey, and although the ex-vessel price was sometimes US$200 per ton, sardines were not available. Sportfishermen were paying US$1.00 per sardine in 1968. The fishery continued in southern California until that night in 1968 when the airplanes led the fleet to the last sardine schools. Capital formation had occurred, from 1889 to 1946, at roughly the same rate as the developing fishery. In 1946, 101 reduction plants were in operation in California. Plant ownership was distributed among a broad spectrum of people. People such as the Legaz family were only one type of owner. Other ownership structures included small investors who had combined funds. These small investors were often groups of fishermen, or cannery workers who, through investment, believed they could give themselves an opportunity to better their position by increasing job security and decreasing middleman costs. Large investors also participated. A number of investors were already wealthy, such as Zellerbach, Fleishhacker and Christopher. Christopher was mayor of San Francisco, and men like Zellerbach and Fleishhacker had friends in high local, state, and federal positions on whom they could call for help, giving these investors more political clout than the small investors. The industry was able to use this clout to either limit laws or block (or at least postpone) effective conservation legislation. By 1968, 80 years after the fishery had started in San Francisco, it was gone. It had collapsed, crumbled, and disappeared. The collapse had taken 22 seasons. The vessels were gone, the machinery was gone, and the people were no longer sardine workers. Fishermen had for years been witnessing the demise of the resource with fewer and smaller schools of fish almost annually. In the 1950s workers still talked about the sardines coming back. A decent season like 1958-59, when 126,000 tons were landed, would keep people hoping for another five years. Many men finally realized that the sardines would not return; the lucky or smarter fishermen went to other fields, other fisheries or other countries. The men who had multi-fishery options diversified. Some of the smaller vessels fished market (Dungeness) crab (Cancer magister), from November through February, others fished rockfish (Sebastes spp. ), albacore (Thunnus alalunga), and salmon (Oncorhynchus spp.). These vessels which changed fisheries would change from eight-man sardine crews to three- or two-man, or even skipper-only crews. The displaced crewmen found employment ashore as painters, gardeners, construction workers, and other similarly skilled positions. Many maintained their relationship with fishing by going to Alaska in the summer, but no longer fished all the year round. Those vessels which could not economically switch from lampara or seine gear fished for squid, anchovy or tuna. In the US none of the displaced fishermen or cannery workers received retraining or assistance from the government to start a new profession. Wooster, this volume). The low prices of the vessels kept fixed costs down, allowing new owners the luxury of learning to fish and market alternative products while having to cover little more than their operating (i.e., variable) costs. At the same time as the vessels were being sold and transferred to other west coast fisheries, other vessels and equipment associated with sardine canning and reduction were being sold in international markets to such countries as Peru, Chile, and South Africa. Although much of the equipment pre-dated World War II, a lot of equipment was relatively new and had been used sparingly, since being purchased in the late 1940s when the fishery was in decline (Sal Ferrante, private communication, 20 September 1989). Peru and Chile were assisted in these purchases by two agencies of the United Nations: the Food and Agriculture Organization (FAO), responsible for increasing the food (particularly protein) supply for Third World nations, and the United Nations Development Program (UNDP), responsible for securing funds for Third World development. Funds supplied by the UNDP were also used to obtain expertise in fishing, canning, reduction, and fishery management. Lampara fishermen from San Francisco and seiners from San Diego went to South America generally for six months to a year to teach fishing methods or as contract skippers. Some men sold their vessels, delivered them in South America and stayed on as skippers of the vessel. As in Alaska, the low price of idle equipment and vessels allowed the sardine and anchoveta (Engraulis ringens) fisheries off the west coast of South America to expand rapidly. This expansion occurred even faster, because of the technology transfer attributed to the expertise of the Californians and the low cost of equipment. Sal Ferrante, an experienced canner and reduction plant operator/owner (and other men like him), was hired to establish a new plant in Peru during the 1950s. From 1958 until 1960 he stayed on to run the plant he established. Ferrante was available to do this type of work because, in 1957, he had sold his fertilizer plant in Oxnard, California, to a South African company. The Oxnard plant was almost new and he received a good price for used sardine equipment, a price equal to about 60 70 percent of the cost of building a new facility. Ferrante's plant was dismantled, shipped to South Africa, reassembled and became operational within a matter of months. Except for the location, nothing in the fertilizer plant had been changed, even the name on the door remained "Ferrante Co."
Other businessmen, such as Leo Hart and Craig Johnson, established companies which sold used machinery primarily to South American countries and to Mexico. Machinery was shipped to these locations from San Francisco, Moss Landing, Monterey, Port Hueneme, Long Beach, and San Diego (Fig. 3.1). Fish meal and oil reduction machinery constituted the majority of the equipment sold to South American enterprises. This equipment was generally older and less costly than the equipment shipped to South Africa. Unlike Ferrante's fertilizer plant, most equipment prices rarely exceeded half the cost of new equipment, and some were sold for one-fifth the new value. Locating these surplus machines in the western US was accomplished via a worldwide network of people who had previously worked in the production and management of California's sardine fishery. Fishery biologists and managers from California became involved in the management of South American fisheries through the United Nations' support of Peru's Instituto del Mar (IMARPE) and the Ministerio de Comercio e Industria. Along with people from California (William Ripply and Frances Clark), Australia (Jeffery Kestevan), England (Phillip Appleyard), and other US citizens (Millian Kravanja and Wilbur Doucet), were local scientists (e.g., Coronel Portillo) attempting to evaluate the sardine and anchoveta resources of the Peru Current. Many of these people had gained knowledge and experience working with California sardine and were attempting to use that experience to manage southern clupeid stocks (William Ripply, private communication, 18 September 1989). Like the industry workers, these scientists had gone south "searching for new raw material" for their scientific skills (Popovici, 1964).